At Lose Weight By Eating we preach clean eating, and believe the best way to lose weight is by eating a healthy diet full of fat burning foods. Losing weight starts in the kitchen, and what you eat is far more important than how you exercise because weight loss is 70% what you eat and 30% exercise. You can exercise daily and not see the scale move if your diet is not spot on. With that in mind, I created the Lose Weight by Eating Diet Plan. 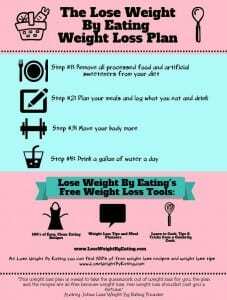 Below you’ll find a weight loss diet plan that emphasizes the importance of what you eat over exercise. Exercise is part of it too, but food is the main focus because this is Lose Weight By Eating. 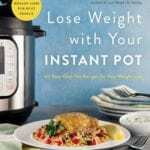 Best of all, the plan and the recipes are all free because weight loss, real weight loss, shouldn’t cost you a fortune. Follow the 4 Steps below and try to tune out the noise of the fad diets. This tried and true weight loss plan has helped thousands of people lose weight and keep it off. Step #1: Remove all processed foods and artificial sweeteners from your diet. Step #2: Plan your meals and log what you eat and drink. Step #3: Move your body more. Step #4: Drink a gallon of water a day. Below we will drill down into each step, but before we do that I want to stress that each of these steps are just goals, not rules. If you mess up, that’s ok, we all mess up. It’s what you do after you mess up that counts. I’ve included a list of FAQ’s (frequently asked questions) at the end of the post for answers to common questions. You know the saying “I’ll just start again on Monday”? Or the feeling that you have “blown” the day so you might as well splurge all day? This is most often the one thing that holds people back from weight loss success. Instead of using that small splurge, or missed workout to blow it all, hit your “reset” button. Just get over it, we all splurge, using it as a crutch won’t help, and making up for it by skipping a meal is not a good idea either. Just hit your reset button and move on. Love cheese? How about chocolate? At Lose Weight By Eating we don’t encourage you to give up what you love, in fact the only thing we encourage you to give up is the artificial foods and embrace clean eating. You wouldn’t feed your pet bird cardboard, would you? No, you would feed them nuts and seeds just like the natural food they have in the wild. It’s time to start thinking of yourself as the bird, feed yourself what humans found and grew in the wild hundreds and thousands of years ago, not “frankenfood” made in a laboratory. You can have your chocolate, but instead of the “sugar free” chocolate candies that are full of artificial sweeteners, have a square of all natural dark chocolate (Chocolate Recipes). As for cheese, choose sharp cheese, you can use less and get the same cheesy goodness, thus saving calories (Cheese Recipes). If you don’t quite feel comfortable cooking in this way, don’t fret. Lose Weight By Eating will provide you with what to eat to lose weight. 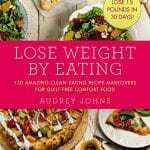 It’s full of easy, delicious low calorie, all natural clean eating recipes that taste like the comfort food you and your family crave. 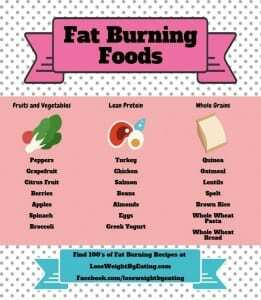 Fat burning foods are a staple in the Lose Weight By Eating weight loss plan. We make small swaps to recipes to turn them into metabolism boosting foods. For instance, swapping out buttermilk for almond milk in a pancake recipe can cut calories and add natural fat burners to your diet. Little changes in recipes and your diet can make a big difference in your weight loss success. Check out some of my favorite metabolism boosting recipes. Fat burning ingredients can be added to many recipes. Just keep in mind that organic food will have more nutrition and therefor more metabolism boosting nutrition. Raw foods also have more nutrition, so a salad with raw spinach will have more fat burning properties than cooked spinach would, so whenever possible have these fat burning foods raw. I realize this sounds like homework, would it help if we called it studying instead? By making a meal plan to lose weight, you are setting yourself up for weight loss success. Have you ever become extra motivated to exercise after a purchase of a new yoga mat, or running shoes? Making a meal plan is motivational in the same way. If you sit down and take the time to plan out your meals you are more likely to stick to it, because you took the time to do it. You’ll find it’s easier to stay on plan knowing you have a yummy meal coming up later today, and you’ll be less likely to splurge knowing you have a plan to follow. How Many Calories Should I Plan to Eat? Say your goal weight is 135 pounds, your daily calorie intake should be 1350 calories. Don’t fret if this seems difficult, below is an example of a super filling 1200 Calorie Diet Plan, just add on snacks to increase your calories. 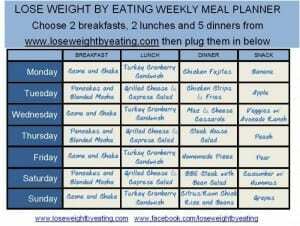 Click the image to download the 1200 Calorie Meal Plan. Weight loss is 70% what you eat and 30% exercise. Many people often think exercise is more important in weight loss and they disregard the healthy diet part. That is why Step #3 is to move more. You don’t have to train for a marathon to lose weight, however exercise will speed up the process and, perhaps more importantly, tone your body. You also have to do your best to move your body more. That can mean taking the stairs instead of the elevator or even working extra hard at physical therapy. Do as much as you can, follow the other 3 steps and you will see the weight melt off. Water is key to losing weight. Besides tasting great, studies have proven that drinking water naturally boosts your metabolism along with many additional water health benefits. It fills you up, flushes your system and naturally increases metabolism. If you can’t get to a gallon, that’s OK. Start slow with 60 ounces per day and increase by an extra 10 ounces each day until you are at a full gallon. Here are some tips to help you drink more water. How do I stay motivated to lose weight? What do I do if I hit a weight loss plateau? I don’t like vegetables, how can I lose weight without eating vegetables? I don’t like water, what should I drink? What is the best artificial sweetener? I have heard a lot of people say they lost between 15-25 pounds the first month. If you want to increase that number start with a Detox Diet Week Weight Loss Cleanse on Week #1, then follow up with this plan. It’s also important that you choose reasonable goals. Reasonable goals are paramount; many people will set lofty goals like “lose 10 pounds this week” then they lose 3 pounds and become unmotivated, when in fact 3 pounds is great. 3 pounds per week is 145 pounds in a year! Set goals you know you can reach. You can always beat the goals, but make sure they are reasonable enough that you are not setting yourself up to lose your motivation. Increase your exercise by 1 hour per week. This can be a Saturday morning hike, or an additional 10 minutes on your daily workout. The important thing is to add an extra hour of activity that week. Try a week long Detox Diet Week 7 Day Weight Loss Cleanse. It’s a one-week detox cleanse that’s just the thing to give your weight loss a boost and help pull you out of a plateau. It can be difficult to navigate the artificial sweetener world but generally I recommend staying away from all artificial sweeteners. 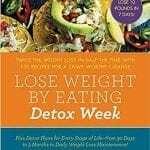 Lose Weight By Eating is a long term plan, but if you’re looking for fast weight loss, try out the Detox Diet Week 7 Day Weight Loss Cleanse. Click on the image to see the full guide. Losing weight doesn’t have to be difficult. With the Lose Weight by Eating Diet Plan, you just have to focus on the 4 Steps and you’ll be on your way to a clean eating lifestyle. You’ll find have more energy, better health, and your food choices will be easier. I encourage you to share your experiences with me and let me know how you’re doing. Remember, if you mess up, like we all do, don’t give up! Hit your reset button and keep going.